Through the centuries, the Christmas season has inspired composers, poets, lyricists and hymn writers to apply their craft in devotion to this event. 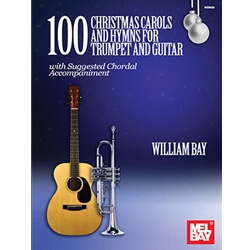 This book presents 100 arrangements of favorite Christmas carols and advent hymns for trumpet solo with guitar accompaniment. Suggested chordal accompaniment is included for each solo so that any chordal instrument can accompany the trumpet. Where appropriate, capo chords are shown. The author has also indicated whether the guitarist should use fingerstyle or strum accompaniment. The music in this book spans centuries and represents a wonderful assortment of solos which may be used as preludes or offertories throughout the various seasons in the church year.